In 2006 my mother expressed her desire to spend a few months with us in Canada. Nidhi and Nikhil were thrilled about the arrival of Granny, but Marina and I were a bit apprehensive. My mother is a diabetic patient and also has complications with her heart. My brothers were also a bit apprehensive, keeping in mind her medical conditions and her age (72 years then). My mother, a strong lady that she is, was totally determined to undertake the journey across the seven seas and told everyone in the family that she would be back for Christmas. She had stayed with us for over two months at almost all our stations of posting, Jammu & Kashmir, Sikkim, Assam, Bengal. Delhi, Pune and Devlali (Maharashtra). While commanding the unit at Devlali, with Marina away in Canada, my mother effectively and efficiently discharged the duties of the ‘First Lady’ and chief hostess at home. Come what may, we decided to get Granny across to Canada and we got her Visa formalities completed. On 30 June 2006, Marina and kids took off to Kerala and stayed there for two weeks and on their return trip, they were accompanied by Granny. Both the children took extra care of the Granny throughout the 22 hours of the flight to Toronto from Kochi and also during her stay here. Nidhi, a fifteen year old teen, would accompany her Granny umpteen times to the washroom, hold her hand and walk with her in the malls, while visiting places of interest, calling on friends etc. At night Nidhi had Granny sleeping with her and she would get up at the middle of the night or whenever Granny wanted to visit the washroom. My mother was a middle school teacher who taught English and Maths. The school being Malayalam medium, English lessons would commence from Grade 5. My mother had done two years Teacher Training Course (TTC) after passing Grade 10. She started teaching when she was seventeen (1949) and she then had many students much elder to her, some married and some even with children. Most of the teachers belonged to our village and many were distantly related to our family. A week after her arrival in Canada, we decided to visit Montreal and take a boat cruise through the St Lawrence River to see various places where pitched battles were fought between the English and French and also historic buildings in Old Montreal. Montreal is about 550 km (about 6 hours by car) from Toronto and is located in Quebec Province with French as the main language. We set off for Montreal on a Saturday morning and after two hours of drive, we decided to have a break and drove into a restaurant. I ordered coffee and doughnut and my mother too wanted the same. I advised her that doughnut is pretty high in sugar and would do no good to her diabetics. My mother was very adamant (once she becomes adamant, there is no way out) and Nidhi picked up a dozen assorted varieties of doughnuts and coffee for everyone. Nidhi explained to her Granny as to what each doughnut was and what they contained (I cannot name more than a couple). Granny had a look, felt her fingers over a few doughnuts and started sipping her black coffee. I asked her as to why she was not eating the doughnut she replied that she only wanted to see what a doughnut was and then burst out laughing. The children became curious about Granny’s laughter and immediately wanted to know the reason for such an unexpected outburst. My mother started off with her narrative. One day at school, the high school English teachers asked her as to what a doughnut was. Such queries always came to her being the senior-most in the middle school and also being better read and travelled than most teachers in the school. That was the first time she heard the word doughnut and she did not have any clue. 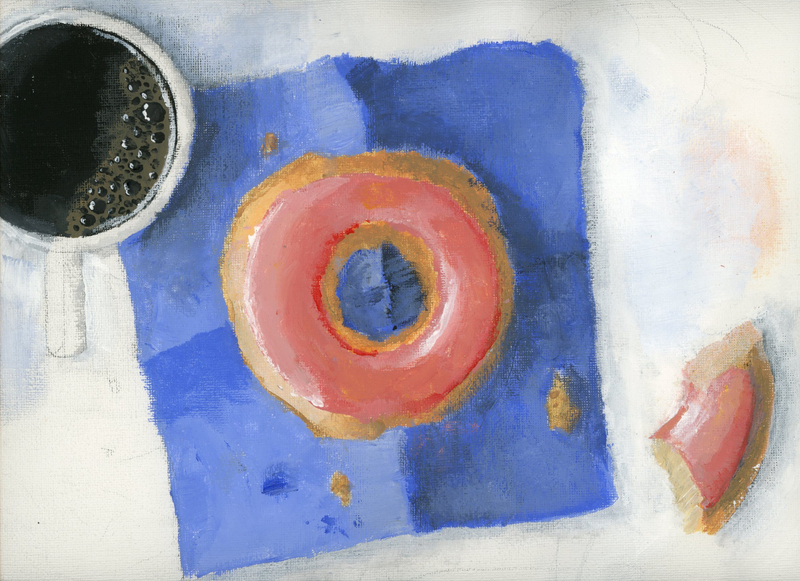 She asked for the context where it appeared and she was told that the line in the text book read “He had doughnut with coffee.” Now she thought for a while and applying her logical mind said that it may be a nut as it was being taken with coffee. It was now that she realised what an actual doughnut was. After exploring the area around and visiting Niagara Falls, it was time for her to get back to Kerala as the severe Canadian winter was fast approaching. By first week of November, I accompanied her on her return journey. That was when I realised how difficult it would have been for Marina and Nidhi to manage her during the 20 hour flight. On reaching Kochi airport all the grand children were there to receive their Granny, whom they missed for five months. One of them remarked “Till date Granny was National, now she has become International”. Thomas Graham is a young artist from Mississauga, Canada. 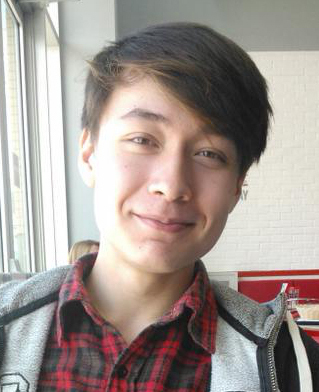 He after graduating from Grade 12 in June 2015, is selected to join the prestigious Ontario College of Art and Design (OCAD) University, Toronto, to pursue a degree in illustration and is looking to become an illustrator by profession. Good one Reji. I also didn’t know for a long time what doughnut or croissant till about when I was 40! 22 hours of flying is a pain for most people and to do so at such an age with such medical problems shows your mother’s determination! Glad that she could finally unravel the mystery of the doughnuts! I have tasted several varieties here in Bangalore, but have not developed any great fondness for it! Wow how lucky your kids were to spend so much time with your mother . Anika’s biggest complaint is that on both sides she doesn’t have grand parents. Remarkable journey for your Mom and it is amazing how kids are so considerate of the grand parents but are toughies for parents. A very good write up Reji. Doughnut, being an English name, the ones you get in India vary from area to area. In northern Kerala bakeries do not know about d’nuts. In Ernakulam area, a long shaped bun with cream in between is the d’nut.